After 4 days of riding, unloading into the hotel, researching the next day and getting out on the road things seem to be getting a bit easier. Too bad today was our last day on this part of the trip. We decided last night to get a little earlier start to try to avoid the heat around Amarillo, since the forecast for New Mexico seemed to be a bit cooler. There were several sites of interest to me on the western side of Texas, so we had to keep moving or get caught up in the heat again. Our first stop was the Cadillac Ranch, an art installation from the 70’s, just on the outskirts of Amarillo. 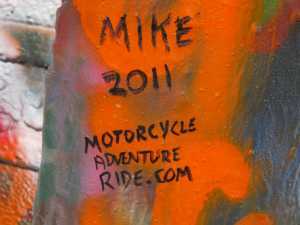 I’m not going to explain it here, lots of other sites do it much better than I would, but it’s 10 Cadillac cars buried nose first, tail up at an angle, in a line in a Texas pasture that people are allowed and encouraged to paint on, climb on, write on, whatever. We didn’t have any paint, but a Sharpie marker was along and used to create our marks. Route 66 runs right next to highway 40, and since we were piling on miles again we stuck to the faster road. 70mph in Texas meant pretty quick coverage of the miles between sites. The biggest problem early today was the crosswinds. Seemed they were coming from the south, and with enough force that it caused us to have to lean the bikes into it quite a bit. I hope the GoPro video shows it. Our next stop was a quick stop in Vega, Texas to look at the Hi-Way Magnolia station there. It’s a restored fuel station that has some old stuff inside, with a few placards that explain a little bit about the history of the station. 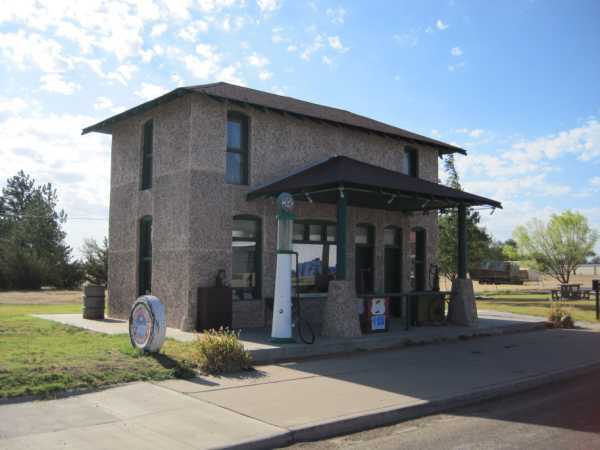 One interesting thing that I learned here is that before there were fuel stations they used to just have the gas in 55 gallon drums behind a store our something, and they were delivered by train. People would use a hand driven pump to get the gas into their vehicles. We stayed long enough for me to read the cards and snap a few pictures, then we were on our way again. The days second stop put us in Adrian, TX at the “midpoint” of Route 66, at the aptly named Midpoint Cafe. 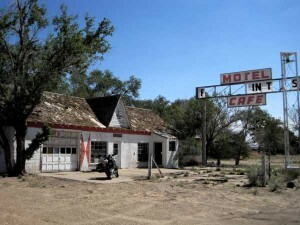 This cafe was the inspiration behind Flo’s cafe in the movie cars, and is known for it’s “ugly pie crust”. Even though it was only 10 am, it seemed wrong not to try it, so I had a peach cobbler. Not something I’d normally order, but it was fantastic! If you ever find yourself in the area you’d be doing a disservice to yourself to not stop and order something. Leaving there and continuing, we stopped again in what is left of Glenrio, Texas. A casualty of the new interstate, nothing much remains of the old service stations and hotels that were here. I stopped in front of a few of them long enough to get a few pictures and look around little and we got back on the road. 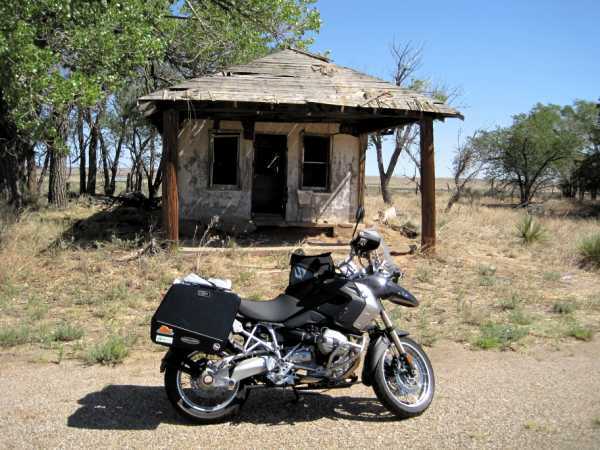 Our last real diversion was Tucamnari, New Mexico. We followed the exit for historic route 66 from the interstate and drove through town. I wish we could have gone through at night, there are so many neon signs I’d imagine out to be quite amazing. 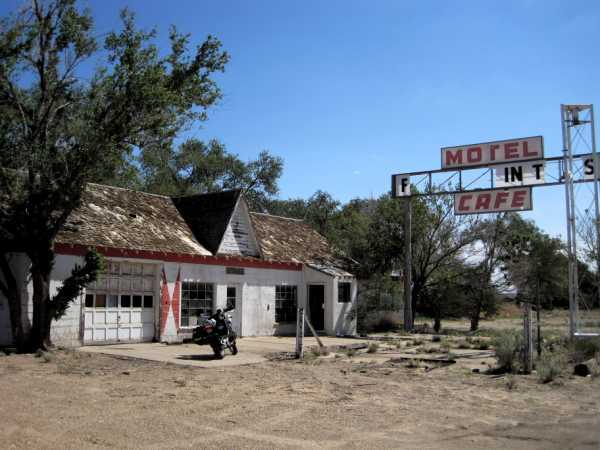 This is the town that has the Blue Swallow motel, which I think also influenced the movie “Cars”. It’s notable because it has a ton of neon and because every room has it’s own garage to park in. Sadly, we didn’t get to see the lights on and just drove by. I’m hoping the GoPro got a picture, but it’s hard to go through the 9000 photos from the day on the tiny computer that I’m using. Thats really about it for this section of the trip. We blasted the last 150 or so miles into Albuquerque (that word is really fun on a swype keyboard,btw) (yes, I’ve been entering the last 3 days posts on my phone) at 75mph, the speed limit in New Mexico. The scenery coming into town was really pretty cool, and it sure felt like the turbulence on the motorcycle from the wind was greatly reduced. I don’t know if it was the altitude and thinner air or the wind died, but it certainly made the riding much more enjoyable. Tomorrow is “get the motorcycles some cool new tires” day, and a rest day, so I likely won’t be updating this. We leave for the Continental Divide on Saturday and I will update then, assuming I have some kind of internet and any energy left.